Daimler is celebrating the recent Smart unveiling by slamming the new ForTwo head-on into a Mercedes-Benz S-Class. Both the diminutive city car and the full-size luxury sedan are brought up to 50 km/h and aligned for a 50-percent front overlap, demonstrating the integrity of the ForTwo's 'Tridion' safety cell as the car strikes another vehicle weighing more than twice as much. "The new Smart ForTwo meets high safety standards, some of which far exceed legal requirements," the company boasts. "As the smaller and lighter vehicle in the collision ... the smart offers its two passengers an intact occupant space and excellent chances of survival." The ForTwo's steel cage helped the previous generation achieve surprisingly good ratings in official crash tests. A rear-engine layout allows the front end to be optimized as a crumple zone, without worrying about the three-cylinder mill pushing back into the cabin. The Insurance Institute for Highway Safety cautions that, despite the previous-generation ForTwo's good rating in single-vehicle accidents, the city car offered poor protection in a frontal collision with a midsize car. "In a collision involving two vehicles that differ in size and weight, the people in the smaller, lighter vehicle will be at a disadvantage," the IIHS wrote in 2009 after testing the ForTwo, Toyota Yaris and Honda Fit. "The death rate in 1-3-year-old minicars in multiple-vehicle crashes during 2007 was almost twice as high as the rate in very large cars." Notably, Daimler's promotional video shows the moment of impact but not the aftermath. Smaller vehicles in such scenarios typically are pushed backward by the heavier vehicle, subjecting occupants to additional force. 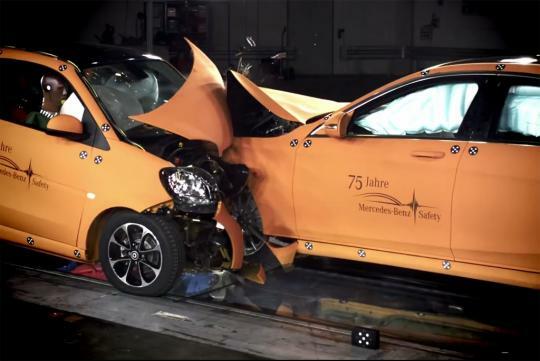 The new ForTwo and its larger counterpart, the ForFour, will likely be assessed in another round of IIHS crashworthiness tests, including the challenging small-overlap test that was added in 2012. ""Both the diminutive city car and the full-size luxury sedan are brought up to 50 km/h""
Eh? Why they never show the passenger side of the Smart ForTwo? It looks totally crushed!! Just like rollercoasters. First you build it, test it without anyone on it, then you test the ride again with dummies, and if it passes, add on the people who built the ride, the crew and staff, and then open it to the members of the public.